For home or travel, our Hidden Pocket Bag is a perfect way to discreetly store your small private, personal items such as jewelry, prescriptions, lingerie, travel documents, etc. Designed to accommodate most standard hangers, just slide the hanger into the sleeve of the bag, place your private items inside the pocket, zip it close, and hang in a closet. 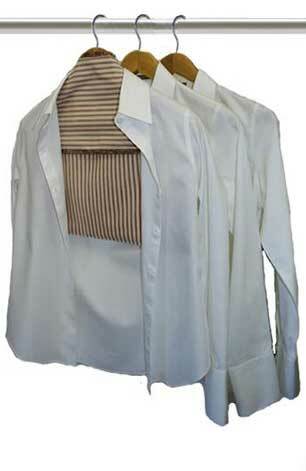 The Hidden Pocket Bag becomes 'invisible' when you place a shirt or jacket over it. Made in the USA of 100% cotton outer shell and water resistant nylon fabric lining. Machine wash, gentle. Do not bleach.